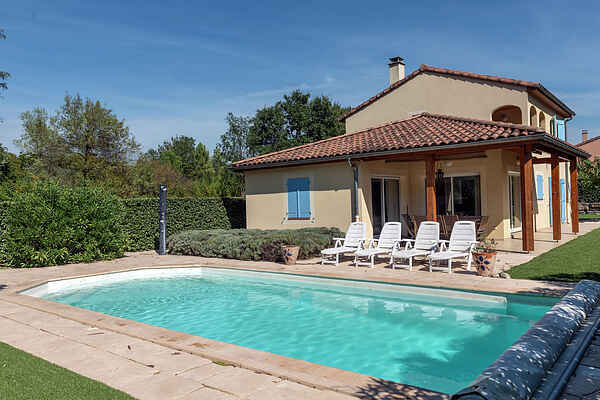 Detached villa with a heated private swimming pool, located in a spacious villa park with multiple facilities including a large communal pool with children's pool, a tennis court, a basketball court and playground equipment for children. The park is located in the immediate vicinity of the picturesque village of Vallon Pont d'Arc, at walking distance from the banks of the Ardèche. The villa has a cozy fireplace and a large tiled terrace. In the evening, you can enjoy the quiet and the magnificent view over the mountains from the covered terrace. Or you can take a refreshing dip in your private swimming pool (salt water pool instead of chlorine). In the shed, there are a few children's bikes and lots of toys for the children to use in the pool. Five minutes away by foot, you'll find restaurants, cafes, an ice cream parlor, a bakery, a supermarket and more. Canoe rental is also a 5 minute walk from the park. At about 1.5 km, you will find a ULM base where you can book sightseeing flights per ULM over the Ardèche. The park is largely fenced and the Dutch-speaking manager is available day and night. The park, accessible through a stately driveway, feels like a small village.